The program for the 13th annual Queensland Supply Chain and Logistics Conference is now available. 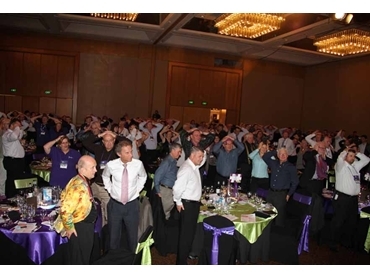 Themed '5 Steps to Supply Chain Success', the 13th Queensland Supply Chain and Logistics Conference will be held on Thursday the 23rd and Friday the 24th of August 2012 at the Sofitel Hotel Brisbane, and features an extensive line-up of speakers. The Queensland Supply Chain and Logistics Conference is ideally suited for Supply Chain, Logistics, Transport and Procurement professionals and practitioners. A uniquely-styled educational event, the conference is designed for both professional and personal development in a relaxed environment. The event will feature Air Marshal Mark Binskin AO, Vice Chief of the Defence Force as keynote speaker and the voice of the GPS, Karen Jacobsen as the Friday morning address. Additional speakers include Anthony McLean, National Manager Persuasion Skills, New Intelligence, Thomas Hughes, Manager-Operations, Clyde Babcock Hitachi, Nathan Hall, National Purchasing Manager, Mitchells Quality Foods, Craig Lardner, Principal, Procurement Advisory Services, Roger McNeill, Chief Procurement Officer, QR National, Dr Abe Ninan, Manager - Procurement Analysis Team, Department of Transport and Main Roads, John Lee, A/Senior Director Health Services Purchasing and Logistics, Queensland Health, and Sharyn Scriven, Group Manager Procurement & Supply, Energex Limited. The Queensland Supply Chain and Logistics Conference is organised by leading industry associations including the Supply Chain & Logistics Association of Australia (SCLAA), the Australian Institute of Packaging (AIP), QUT School of International Business, CIPS Australia, the Australasian Production and Inventory Control Society (APICS) and the South East Queensland Procurement Network group. 2012 Partners include Haymans Electrical Data Supplies, apics, Corporate Express, Corporate Scorecard, Konica Minolta, OfficeMax, SDS, CNW Electrical & Data Supplies, Cyberscience Corporation, Open Windows, Strategix Training Group, Epicor, LSC Consulting and Transpacific Industries Group.